Being a Google device, it offers latest Android experience without any bloat. Since its inception, Android has served as an affordable alternative to the iPhone. Being open and scalable, Android runs on a variety of hardware. Android portfolio includes budget, mid-range, and premium phones, which is a great thing. However, it also has a flipside when strictly considering the premium smartphone segment. Apple's phones are incredibly stable and optimised, whereas Android devices are more likely to behave erratically. There's a good reason for that though. When updating the operating system, Google must consider millions of hardware permutations and combinations. On the other hand, Apple only has to fine tune iOS for its own hardware. To address this issue, Google launched the Pixel programme. The search giant worked closely with select Android manufacturers to roll out the Pixel and Pixel XL last year. These devices were a huge step in the right direction. The Pixel phones proved that with control over hardware and software, Google can take on Apple's iPhone. Pixel’s second iteration has even bigger responsibility. 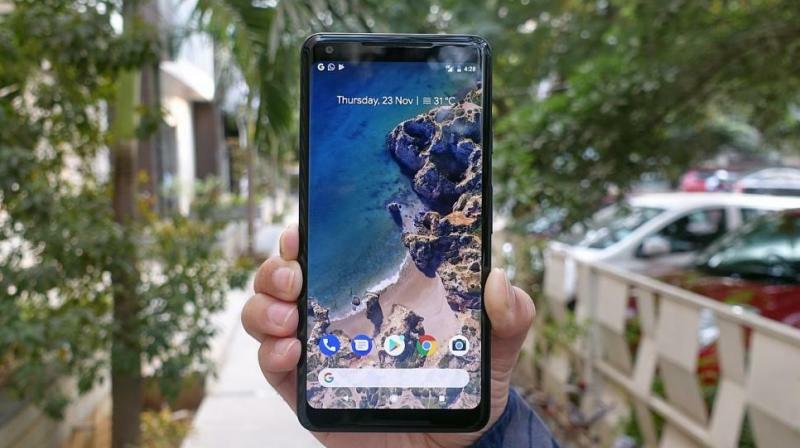 Especially, the Pixel 2 XL not only has to challenge the latest iPhone but also fight off the Galaxy S8, Note 8, and HTC U11, to be the best Android flagship in town. You go to a party wearing a white shirt and blue jeans. In the next party, being lazy, you end up wearing same apparels. To make it look fresh, you pull up your pants all the way to your neck. This is Google's design philosophy for Pixel. It simply pulled up the metal half in its dual tone design. In the premium segment, most brands are busy bringing out design innovations. However, Pixel simply ignores it. What's worse is that the phone lacks the fine detail you expect after paying so much money. The lens protrusion at the back not only makes the phone wobbly but also showcases shoddy craftsmanship. The retail unit I bought has also had the irregular gap between the lens and the rim surrounding it. The line on the back, where the glass and metal meet to form the dual tone design, does not fit seamlessly either. The ditch attracts dust and then there's no easy way to get it. For years, I have seen brands not paying attention to detail in the budget category, which is fine. But, Xiaomi changed that notion by delivering exceptional fine detail at affordable prices. In contrast, Google, and its hardware partner LG have not bothered much with finesse. The similarly priced Galaxy S8 from Samsung oozes quality. It shows the passion and dedication of people involved in making the device. Hold the phone for a minute, and it feels that people were made to build the Pixel 2 XL against their will. It does get a few things right though. For instance, the phone has thin bezels. More importantly, it does not have a hideous notch found on the iPhone X. Irrespective of the colour you choose, the fascia comes in black. That's a clever decision as black is much better at hiding the front-facing camera and sensors than any other hue. OLED is the holy grail of display technologies. Unlike cheap LCD tech, it does not require a backlight source. Each pixel in an OLED screen has self-luminance. It produces perfect blacks and usually vibrant colours. While the screen has inherited advantages over LCD panels, LG and Google have somehow managed to spoil the party. For starters, it is one of the dullest OLED panels I have ever seen. Even with colour preference set to 'Boosted' and 'Saturated', the display looks awfully drab. The phone uses a pentile matrix screen. Such pixel arrangement usually leads to a slight blue tinge. In most cases, it is hardly noticeable. But, in Pixel 2 XL's case, you simply can't ignore it. The moment you open Android Play Store, Microsoft Word, or anything with a prominent white background, you realise how cold (blueish) the display is. The screen also has a black smear issue. However, you won't notice it unless you set the screen brightness low at around 20 percent for night reading. Overall, the screen has a lot of problems for a phone named Pixel. LG likes to call its OLED screens P-OLED, where P stands for plastic. These displays are cheaper to manufacture and resilient to flex. Like most modern screens these days, the Pixel 2 XL's 6-inch display is sharp. For those interested in numbers, it packs in 1440 x 2880 pixels. It has a pixel density of 538 PPI. It is the first Pixel series smartphone to features a tall display with 18:9 ratio. The Pixel 2 XL runs the latest version of Android Oreo. It is not the first smartphone to feature Android Oreo but is surely the one to deliver the unadulterated experience. Android purists love the stock Android experience. This time around, to appeal to laymen, Google has also added some much-needed eye-candy. I always rejected live wallpaper feature on Android for being gaudy. But, Google has changed my perception with its latest subtle animated wallpapers that are a treat to look at. I'm especially hung on the 'A walk in the clouds' wallpaper, which is reminiscent of the opening sequence of Kubrick's masterpiece The Shining. The icons look neat on a tall high-resolution screen. Most of the system icons are now circular. However, the app icons still come in all shapes and sizes. So, there's still some time before you get cohesive icon scheme. Google has polished the transition effects and animations in the latest version of Android. For instance, pulling up the app drawer gently increases the opacity of the pane before becoming entirely white. The top row features the most frequently apps. Rest is arranged in an alphabetical order. If you press and hold an app icon, some apps provide you with quick actions. For instance, PayTM app lets you instantly view balance, add money, or pay. The Pixel 2 XL also offers Active Edge gesture. It works much like HTC's Edge Sense — squeezing the bottom half of the phone to summon the Google Assistant. There's no way to configure it to trigger any other app. But that's alright as the Active Edge is a gimmick and the only time you are going to use it is when showing it to your friend. The settings menu is streamlined. It is now much easier to find what you are looking for thanks to sensible grouping. Notification panel has not changed much. First pull gives you a row of quick toggles. Pulling it down further provides you access to more toggles. Like most flagship phones this year, the Pixel 2 XL is powered by Qualcomm's Snapdragon 835 chipset. Paired with stock Android with no bloat at all, the phone pulls of amazing performance. Be it menu navigation or switching between the apps, the phone never showed a sign of a slowdown. The Adreno 540 handles resource hungry games without any issue. I tested games such as Dead Trigger 2 and Asphalt 8. There were no dropped frames or any noticeable stutter. Thanks to the powerful processors and 4 GB of RAM, the loading times were quick too. Google Play Music is the default audio player. It has a terrible UI that shoves Google music collection down your throat (ear). Finding your locally stored music collection is tricky as Google has tucked it away in the hamburger menu. The phone lacks a 3.5 mm jack. So, the type C USB port also doubles up for audio out. What this means that you can't charge your phone and listen to music simultaneously. Good job, Google! If that wasn't annoying enough, the search giant has not even bundled earphones with a phone that costs a whopping Rs 73,000. The phone comes with a lousy USB type C to 3.5 audio jack adapter though. It looks so awful that I won't use it outdoors even if someone put a gun to my head. I did hide myself to test the sound output though. And as you would expect from a flagship phone, the audio output is amazing. The loudspeaker is sufficiently loud to let you watch web videos without having to put on the earphones. There's no dedicated video player. You can either play movies via Photos app or install MXPlayer. Since the screen has a tall aspect ratio, you must put up with letterboxing while watching your favourite videos. Lastly, the phone's network and Wi-Fi reception were top notch. The earpiece and microphone work well too. The original Pixel XL had an excellent camera. And the Pixel 2 XL improves upon that. Sure, at 12.2, the megapixel count hasn't changed. But, the new Pixel 2 XL now comes with OIS (Optical Image Stabilisation, which was missing in its predecessor. Its dual-autofocus system uses laser and phase detection in tandem to lock on the subject. I must say the camera is swift to lock focus. In the daylight, Pixel 2 XL performs incredibly well. It captures sharp images with plenty of detail. The colours too look very good. Its low-light performance is on par with other premium phones such as the Galaxy S8. The camera captures 4K videos at 30 fps. You can also shoot slow-motion videos at 240 fps at HD quality. With OIS working with Google's brilliant EIS (Electronic Image Stabilisation) algorithm, the camera captures video with minimal yanks. The 8MP front-facing camera is good enough to please the selfie-addicts. In addition to clicking good stills, it can also record Full HD videos at 30 fps. Overall, the Pixel 2 XL has a stunning camera. Though I really miss the dual lens camera wizardry found on the Galaxy S8 and iPhone 8 Plus. The Pixel 2 XL packs a 3,520mAh battery. On moderate use, the phone easily lasts for over a day and a half on a single charge. Thanks to Qualcomm's Quick Charge tech, charging the phone for merely half an hour can keep it powered for roughly half a day. The Google Pixel 2 XL takes on the likes of Galaxy S8, HTC U11, and latest iPhone X. However, in terms of build quality and design, it is nowhere near any of its premium competitors. In fact, LG's own G6 feels a lot more polished than the Pixel 2 XL. The phone has a few bright spots such as a brilliant camera. Being a Google device, it offers latest Android experience without any bloat. Unfortunately, it is riddled with too many shortcomings that outweigh its good points. Overall, a badly calibrated screen, boring design, and lack of fine detail in design make it a wasted opportunity. Its base variant with 64 GB storage costs Rs 73,000 and you are expected to shell out Rs 82,000 for 128 GB variant. I don't have a problem with expensive smartphones, but the Pixel 2 XL simply fails to justify its price tag. If you are looking for the best smartphone in the premium segment, Apple and Samsung are still the brands to go for. Excellent camera; Latest and bloat-free Android; Excellent multimedia performance.